Like many others I’ve seen tons of articles, pictures and hashtags regarding drinking a gallon of water a day and the benefits that followed. Men and women have jumped on the band wagon and have posted images of vast improvements in their weight, complexion and hair and nail growth. We here at tgin decided to join the party and have also noticed great physical benefits as well as internal health benefits! Here are 7 benefits to look forward to when drinking a gallon of water a day. Drinking water helps to relieve daytime fatigue better even than coffee! When you are drinking a full gallon of water a day your energy will be heightened and you won’t feel tired as easily doing your normal daily tasks. Instead of reaching for that cup of starbucks that is staining your teeth and adding unneeded calories, grab a gallon of water and start fighting off fatigue. Water helps to get rid of the bloat! If you experience frequent bloating drinking a gallon of water a day can help fight it, as opposed to drinking carbonated drinks or alcohol which can cause bloating. Drink water at the first sign of bloat. Not matter what you may put on the surface of your skin, true results come from within. Water helps to keep skin clear of acne as well as skin disorders such as eczema and persistent dry skin. Drinking a gallon of water a day can help to keep skin moisturized from within and help aid in skin ailments. 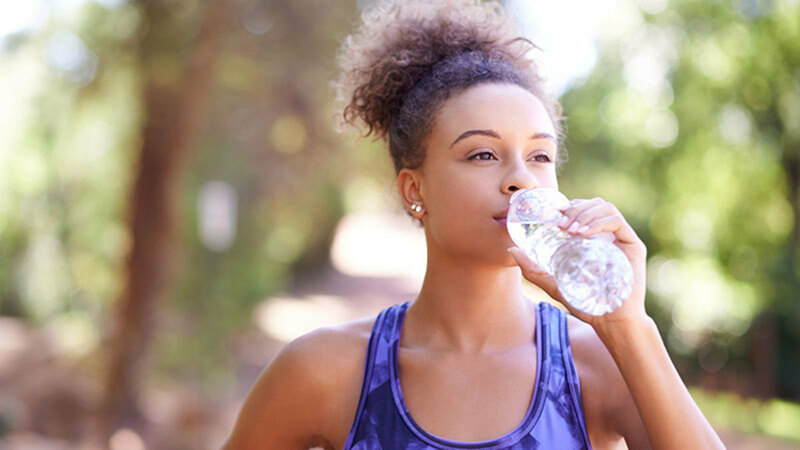 Overall drinking a gallon of water a day gives skin a healthier, livelier appearance. If you are a person who suffers with constant headaches or migraines it could be due to your bodies need for water. Often dehydration can cause headaches. By the time you start to feel thirsty your body is already experiencing a form of dehydration and headaches and discomfort can follow. By drinking water you are giving your body what it needs and requires to keep your boy functioning to it’s optimal potential. Along with its skin clearing benefits, constant water consumption can help to significantly lighten dark under eye circles. Often times dark circles can be caused not only from a lack of sleep or heredity but also from not intaking enough water. Water helps strengthen hair as well as nails and aids in their growth. Water also aids in keeping nails strong and helping hair become less susceptible to breakage. Water helps to flush out and eliminate toxins from the body in addition to speeding up your metabolism. Are you getting your water in?